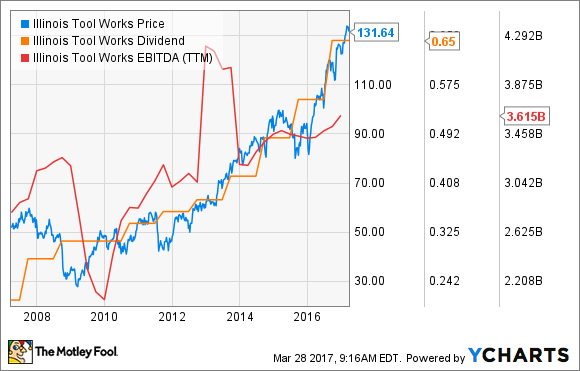 We think these dividend growth stocks are great options for future retirees. One problem many retirees face is that they need to make do with a fixed income. That becomes a serious concern when their expenses rise due to inflation or other unforeseen events, making it harder to make ends meet. However, one way to potentially sidestep these concerns is by investing in stocks that pay a growing dividend. While many companies have a history of dividend growth, what we really want to see are companies that clearly have the ability to deliver a growing income stream in the future. Three that we believe can do just that are Home Depot (NYSE:HD), Illinois Tool Works (NYSE:ITW), and Enbridge (NYSE:ENB). Demitri Kalogeropoulos (Home Depot): Dividend stocks are a no-brainer for retirement-focused investors. If you're a decade or more from leaving the workforce, they allow you to compound long-run returns through dividend reinvestment programs. And, once you've taken the plunge, these investments provide a solid source of steady income. Take Home Depot. Sure, it doesn't have an especially long dividend track record, given that the retailer had to pause its annual raises during the worst of the housing market crisis. Yet its growth since then has been phenomenal. In just the last three years, management has hiked the payout by 26%, 17%, and 29%, respectively. Behind those market-thumping raises is a business that's growing quickly and becoming far more profitable. Sales jumped 6% last year, beating management's original 5% target. Operating margin is 14% over the past year, compared to 9% for rival Lowe's. Rather than shrinking from the challenge posed by the rise of online retailing, Home Depot has decided to make the channel a key part of its overall selling strategy. The results speak for themselves. Digital sales are 5.9% of the overall business. For perspective, Target's digital sales are just 4.4% of its total while Costco's are 4%. Furthermore, nearly half of all Home Depot online customer orders involve a trip to a Home Depot location. That success implies its store footprint will continue to stay relevant with customers, whether they choose to do their home improvement shopping online or at one of its highly efficient warehouses. Daniel Miller (Illinois Tool Works): When searching for stocks to help fund your retirement, there are a few factors you should hunt for, including consistent performance, a large and stable market capitalization, and a decent yield that can grow over time. One company that fits the bill is Illinois Tool Works. The company operates in seven business areas: construction products, automotive original equipment manufacturing, food equipment, test and measurement/electronics, polymers and fluids, and welding and specialty products. It uses its massive scale to drive operating margins between 22% and 25% for each of its business segments. Investors looking at ITW currently are in a good spot, as it's seeing positive results from its "Enterprise Strategy," a massive business reorganization and realignment program that started in 2012. The company changed its strategies to emphasize organic growth instead of acquisitions, among other things, and its annual goal is to achieve organic growth above GDP rates. It also began focusing on being a go-to solutions partner for the 20% of its customers that generate 80% of revenue, simplifying and securing its top-line sales. When you compare its 2012 financial results to last year's, it's clear ITW is making progress. In 2012 operating margin checked in at 15.9% compared to 2016's 22.5%. ITW's after-tax return on invested capital jumped from 14.5% to 22.1% during the same time frame, and its earnings per share has posted a 15% compound annual growth rate from 2012 to 2016, up to $5.70 per share. Also, looking specifically at the fourth quarter, ITW churned out free cash flow of $593 million, 117% of net income, keeping its dividend growth safe. While its current yield of 1.8% won't jump off the page for income investors, you're getting a well-balanced, stable, and consistently improving company that has the cash flow to increase its dividend going forward. Matt DiLallo (Enbridge): Canadian energy infrastructure behemoth Enbridge has paid a dividend to its shareholders for the past 64 years, including raising the payout for 22 straight years. These haven't been token increases to keep a streak alive: Enbridge's compound annual dividend growth rate over the past two decades is 11.2%. Meanwhile, with a pipeline filled with growth projects, there are plenty more dividend increases left in the tank, which is what makes Enbridge such an excellent stock for those looking to boost their retirement earnings. Enbridge currently has 27 billion Canadian dollars ($20 billion) of growth projects under way. The company expects these projects to fuel 12% to 14% compound annual growth in its available cash flow per share through 2019. In addition, the company has another CA$48 billion ($35.9 billion) of longer-term projects in development. These growth projects give Enbridge growing certainty that it can deliver 10% to 12% compound annual dividend growth all the way through 2024. Furthermore, investors don't need to worry that Enbridge is living on the edge to achieve that ambitious growth rate. That's because 96% of the company's cash flow comes from fee-based and regulated assets, which provides the company with cash flow security. Plus, Enbridge only anticipates paying out 50% to 60% of its cash flow via dividends, leaving plenty in reserve to help finance its growth projects. Finally, the company has a solid investment-grade credit rating, which should only improve given that upcoming project completions will reduce its leverage ratio over time, providing even more security for the company's ability to sustain its dividend growth. With a clearly visible pipeline of future income growth, Enbridge has everything an investor could want in a retirement stock.